THIS SOAP GETS IT'S BEAUTIFUL BLACK COLOUR FROM NATURAL ACTIVATED CHARCOAL. WHY NATURAL ACTIVE CHARCOAL? CHARCOAL HAS SO MANY BENEFITS INCLUDING IT'S ABILITY TO REDUCE ENLARGED PORES BY ABSORBING IMPURITIES, BALANCING THE OILS ON YOUR SKIN TO ELIMINATE ACNE AND BLACKHEADS. IT ALSO GENTLY EXFOLIATES YOUR SKIN REMOVING BUILDUPS, ACNE SCARING AND HYPER-PIGMENTATIONS. THIS SOAP IS A LOVELY CLEANSER AND CONDITIONER WITH THE POWER OF CALENDULA. IT CONTAINS HOMEMADE CALENDULA INFUSED OLIVE OIL AND CALENDULA FLOWERS. CALENDULA HAS BEEN USED TO TREAT ACNE AS IT HAS ANTI-INFLAMMATORY PROPERTIES. IT IS SUITABLE FOR EVEN THE MOST SENSITIVE SKIN. 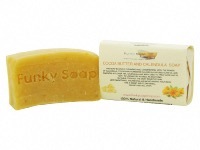 THIS SOAP IS A LOVELY CLEANSER AND CONDITIONER WITH THE POWER OF CALENDULA. IT CONTAINS HOMEMADE CALENDULA INFUSED OLIVE OIL AND CALENDULA FLOWERS. CALENDULA HAS BEEN USED TO TREAT ACNE AS IT HAS ANTI- INFLAMMATORY PROPERTIES. IT IS SUITABLE FOR EVEN THE MOST SENSITIVE SKIN. THIS IS A SOAP BAR MADE WITH FRESH PURO FAIRTRADE COFFEE. WE ARE PROUD TO SAY THAT WE HAVE TEAMED UP WITH FAIRTRADE PURO COFFEE TO CREATE OUR NEW COFFEE RANGE (www.purocoffee.com). THE NATURAL OIL IN COFFEE CONTAINS ENZYMES THAT DETOXIFY, DEODORISE AND CLEANSE YOUR SKIN. THESE PROPERTIES CAN HELP UNCLOG PORES, MAKING IT IDEAL FOR TREATING ACNE, ECZEMA AND OTHER SKIN PROBLEMS. THE NATURAL CAFFEINE FOUND IN COFFEE HELPS SOOTH SUNBURNED , WINTER-REDDENED AND SENSITIVE SKIN IN THE MOST GENTLE WAY. THIS IS A SOAP BAR MADE WITH FRESH PURO FAIRTRADE COFFEE. WE ARE PROUD TO SAY THAT WE HAVE TEAMED UP WITH FAIRTRADE PURO COFFEE TO CREATE OUR NEW COFFEE RANGE (www.purocoffee.com). THE NATURAL OIL IN COFFEE CONTAINS ENZYMES THAT DETOXIFY, DEODORISE AND CLEANSE YOUR SKIN. THESE PROPERTIES CAN HELP UNCLOG PORES, MAKING IT IDEAL FOR TREATING ACNE, ECZEMA AND OTHER SKIN PROBLEMS. THE NATURAL CAFFEINE FOUND IN COFFEE HELPS SOOTH SUNBURNED, WINTER-REDDENED AND SENSITIVE SKIN IN THE MOST GENTLE WAY. 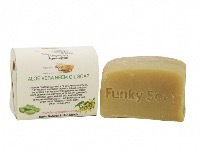 THIS IS A FRESH AND REVITALISING SOAP WITH A ZESTY AND HERBAL SCENT. IT CONTAINS ESSENTIAL OILS OF ROSEMARY, LAVENDER AND LEMON TO AWAKEN YOUR SENSES AND SOOTHE YOUR SKIN. THE SHEA BUTTER AND WHEATRGERM OIL WILL PROVIDE EXTRA CONDITIONING. IT IS VERY GENTLE ON YOUR SKIN AND WILL TONE, CLENSE AND PURIFY YOUR FACE AND BODY.